Uart is one of the most popular pastel papers in the United States. 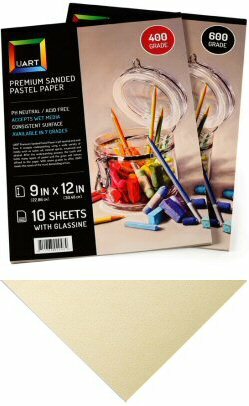 It is a sanded pastel paper which provides a reliable, quality surface for pastel artists. It is 300gsm, Ph neutral and acid free. The paper is manufactured using a computer-controlled electrostatic coating process which provides an extremely consistent sanded surface. This allows you to work with complete confidence from edge to edge. The paper handles many layers of pastel with ease and fixative is generally not required. The paper also accepts underpainting with oils, watercolour, inks and acrylic. The paper is available in seven grades. - 240 Grade, Very Rough. - 320 Grade, Medium Rough. - 500 Grade, Medium Fine. - 800 Grade, Extra Fine. UART is now available in a dark colour. The 400 grade is a rich black colour, whilst the 600 and 800 grades lean more towards a dark charcoal colour. UARTs new mounted boards are made from a strong PVC material that is the perfect solution for plein air artists or artists alike that are looking for the convenience of UART’s sanded pastel paper pre-mounted on an ultra durable and dent resistant board. The boards are very light and only 1/8th inch thick which make them perfect for travelling. Also, there is no border on the boards allowing you to paint from edge to edge. Large sheets are denoted with an L. For some country and remote areas we may need to provide you with a shipping quote prior to despatch. Rolls need to be delivered by courier due to the dimensions.